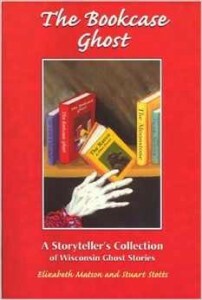 Published in 1997, The Bookcase Ghost by Stuart Stotts and Elizabeth Matson contains 18 spooky Wisconsin tales, suitable for adults and kids above the age of 9 or so. Gathered from local sources and historical archives, these stories will raise the hair on your neck, or make you laugh with suspenseful joy. The book also include a primer on telling ghost stories. Available through Amazon or a local bookseller.